Don't miss out! Stampin' Up! is offering FREE SHIPPING on ALL orders this weekend! 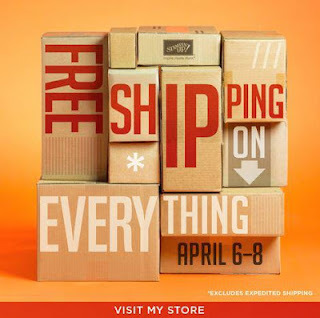 April 6-8, EVERYONE will get free standard shipping on ALL orders (no minimums, no limits)!! This is a great opportunity to pick up some of the little things you always need, but hate to pay extra shipping on. Or to get something you have been just dieing to add to your collection. I'd be glad to order for you. Lovely as a Tree, but not for me!